The Automobile Club of Southern California and local law enforcement agencies that make up the San Diego County Regional Auto Theft Task Force (RATT) teamed today to expand car theft prevention with free vehicle window VIN etching at the Auto Club’s Escondido branch. RATT is a multi-agency task force led by the California Highway Patrol-Border Division. Other members of RATT include the San Diego County Sheriff’s Dept., Escondido Police Dept., the San Diego District Attorney’s Office, California Dept. of Insurance and the National Insurance Crime Bureau (NICB). 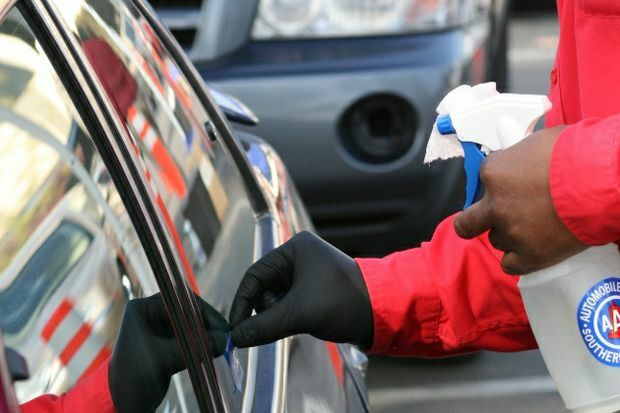 Window VIN etching consists of stenciling the unique federally-registered 17-digit VIN onto a vehicle’s windshields and windows. The process takes about 6-8 minutes per vehicle. The stencil lightly marks the top layers of glass, but does not weaken the windows. “Window VIN etching makes a vehicle less desirable to thieves, because the process make disassembly at a chop shop more difficult and the parts less able to be resold,” said the Auto Club’s Escondido Branch Manager Amanda Becker. If thieves change the VIN plate number on the front dashboard of a vehicle, then they must change the etched windows that are stenciled with the unique vehicle number which costs money and cuts into their profit. Un-etched windows do not pose that problem. Although auto theft is declining nationwide, it remains the number one property crime in America. RATT has said that about 10,000 vehicles are stolen in San Diego County each year. The FBI Uniform Crime Report noted 606 car thefts within Escondido in 2015. California was the top state again for auto thefts in 2016, with the theft tally at 186,857, valued by the FBI as a $1.3 billion loss. The top stolen vehicles were: the 1996 and 1997 Honda Accord and 1998 Honda Civic, according to California Highway Patrol statistics. “Although viewed as a property crime, most suspects arrested for vehicle theft are also involved in other criminal activities,” said CHP-Border Division Officer Ray Payton. “Some vehicles are also targeted by car thieves to steal third-row seats in SUVs, airbags in-car entertainment and factory navigation systems and paperwork to steal identities, Payton added. “Working together, law enforcement and organizations like the Auto Club are able to help educate our community members better protect themselves from being victimized by car thieves,” said the Escondido Police Dept.’s Public Information Officer Lt. Justin Murphy. In addition to window VIN etching, drivers received tips from the Auto Club, SDC RATT, CHP-Border Division, the San Diego County Sheriff’s Dept., the Escondido Police Dept. and NICB to help prevent their cars from being stolen.